The responsibilities vested with the government regarding the unitary status of the country as per the Constitution, and the place given to Buddhism should never shirk under any circumstance, President Maithripala Sirisena said. He made these observations at the ceremony to present the Scroll to the newly elected Chief Sanganayaka of the Eastern Province and Thamankaduwa, Egodapattu, Venerable Makuruppe Pannasekara Nayaka Thera at the Mahaweli Shalika Hall Dehiattakandiya, on Monday. The President said even a draft of the new Constitution is not ready yet and if the draft Constitution is prepared, it will be presented to Parliament and to the country. Thereafter, considering all suggestions and criticisms the draft will be prepared with relevant amendments, the President added. The President emphasized that no change will be made to the clauses of the Constitution regarding the unitary status of the country as well as to the provisions regarding Buddhism in the 1972 Constitution. President Sirisena said the expectation of the people regarding the new Constitution is to see a change in the existing electoral system and to introduce Proportional Representation System. He said in the process of building national reconciliation and devolving power, a scientific political mechanism would not under any circumstance, divide the country or change the unitary system. Anunayake of the Asgiriya Chapter Ven. 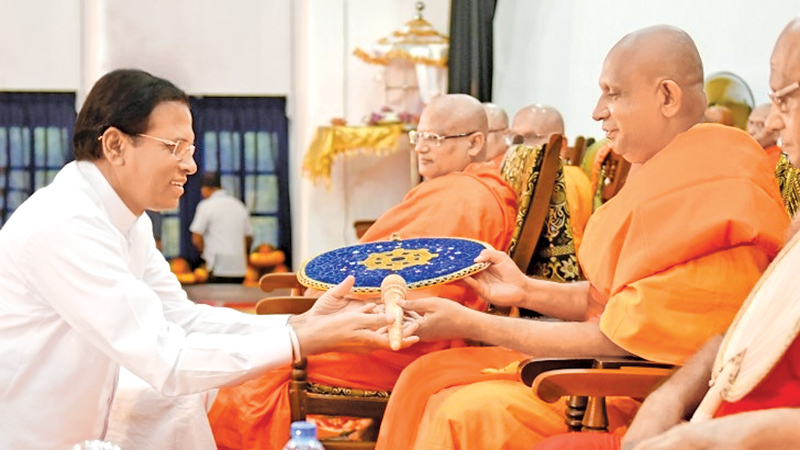 Anamaduwe Sri Dhammadassi Thera presented the Scroll to the newly elected Chief Sanganayaka and the President presented the Vijinipatha (the traditional fan) to the new Sanganayaka Thera. The Maha Sangha including Secretary General of Asgiriya Chapter Venerable Dr. Medagama Dhammananda Thera, the Chief Incumbent of the Mahiyangana Temple, Urulawatte Dhammarakkitha Thera, Chief Incumbent of the Rangiri Dambulla Rajamaha Viharaya Ven. Dr. Godagama Sri Mangala Thera, Ministers Nimal Siripala de Silva, Daya Gamage, Deputy Minister Anoma Gamage, North Central Province Chief Minister Peshala Jayaratne, Chief Minister of the Central Province Sarath Ekanayake, Chief Minister of the Eastern Province Nazeer Ahmed and others participated. The President later opened the Mahaweli Hela Bojun Hala at Dehiattakandiya. The President also opened the new Zonal Education Office, Dimbulagala and the ICT Education Centre. After unveiling the new Zonal Education Office, the President symbolically handed over the official identity cards to teachers marking the event to present the official identity cards to teachers in the North Central Province. Addressing the gathering, the President said the resources needed for the education sector were not given during any era, like the present period. The President said although some are talking about a major development, if there are no desks and chairs in schools and if there is no drinking water for children, questions arise if the major development we are talking about is practical. The present government’s development policy is to remove the basic inadequacies before taking up massive development projects. The President vested the newly built Technology Laboratory at the Medagama Secondary School with the students. President Sirisena after opening the newly built Technology Laboratory, inspected it and promised to construct a new building comprising eight classrooms for the school. The President praised the many creations of schoolchildren and appreciated Dhanushka Abangala, a Grade 13 student for his innovation of a hand tractor. The staff of the school, including Principal R. M. Shantha and parents participated.